Concrete primarily consists of sand, cement, gravel, and water. With time, the water evaporates from the concrete and the ingredients left behind cure into a hard and solid slab. Regrettably, the curing process results in the slightly shrinking of the concrete to birth hairline cracks. While concrete installations like driveway, walkway, patio, and walls are usually able to last longer, most usually end up developing holes and crevices, cracks and gaps. If you have a concrete patio, path or driveway that has begun to crack, it is important that you fix the crack as soon as possible. That is because apart from concrete cracks being a tripping hazard, they also compromise the visual appeal of your dwelling. Moreover, a small crack can develop into a bigger crack and thus make it even more expensive and difficult to fix. Despite the fact that fixing some concrete cracks, especially bigger ones, may need the expertise of a professional, it is also possible for almost anyone to fix concrete cracks or do patio repair. First, chisel the particular crack to be fixed using a masonry chisel and a hammer. This helps for the purpose of widening the base of the crack to remove any loose material and helps the masonry patching material to easily attach with the old concrete installation. Use a wire brush or a whisk broom to remove all the debris and dust from the crack. You can even clean the crack using a garden hose combined with a spray nozzle, or a pressure washer. Water and debris should be eliminated from the crack using a brush or wet/dry shop vacuum. Ensure that there are no pools of water found inside the crack. Follow the manufacturer directions to mix the patching compound. Consequently, trowel the concrete patch into the crack. The patching compound should be stabbed with a trowel to help it settle deeper into the crack and eliminate air pockets. The crack should be filled with the patching compound up to the concrete surface level. Use the trowel to smooth the patch surface. You can brush the patching compound surface using a dry paintbrush for the purpose of texturing the surface. As directed, let the patching compound cure and if needed, apply an additional patch. You can paint/seal the patch surface if you see fit to avoid the absorption of stains and cracking by the concrete. This is how you can accomplish concrete walkway, driveway, path, and patio repair. It is possible for you to fill narrow concrete cracks using concrete filler, applied using a caulking gun. Another alternative way is for you to use any of the available products, available in bottles and have an applicator tip. Very small concrete cracks are able to be fixed using a masonry patching product like hydraulic cement. 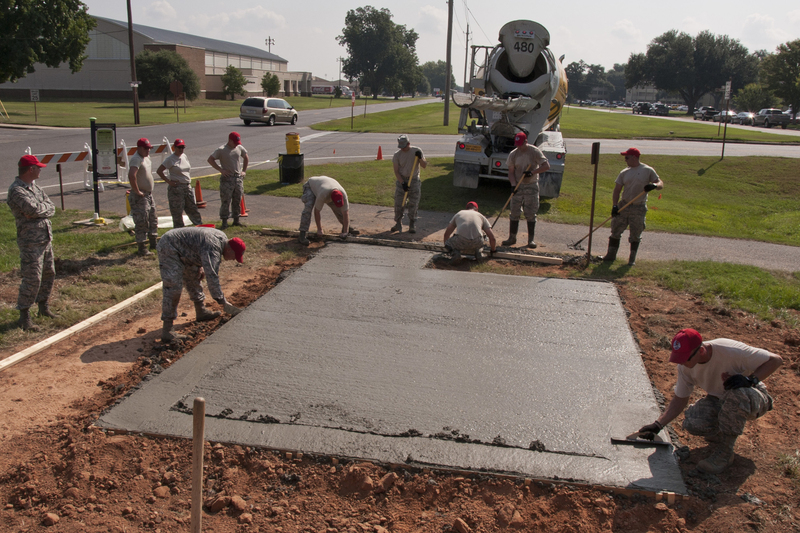 The concrete patching compound is applied over the particular crack and smoothed using either a knife or trowel. If you are dealing with hairline cracks, it is important to understand that the application or use of a crack filler or repair caulk over the cracks is not recommended since it is not effective. Over time, the applied caulk on the surface tends to strip or peel off. If the narrow crack is deeper into the concrete slab, it is better if you start the crack repair by bulking the crack using a foam backer rod. This enables you to create a base for holding the repair material. Foam backer rod is available in a variety of sizes and can be stuffed into the crack using a screwdriver. The walkway, wall, driveway, and patio repair material should be applied according to the instructions of the manufacturer.